The New House Color. Wanna help me decide? If you have asked to join the Whole 30 group I mentioned and have not been able to, I apologize. As I mentioned, I am not the admin of the group this time around, and, for some reason, the link to ask to join the private group does not work for most people. I have tried adding folks as a member of the group, but unless I’m personal friends with you on FB, it won’t let me. I have also tried adding you via an email invite, which you may or may not have received. Basically, I thought it would be easy because, when I created the group for the 14 Day Cleanse back in the fall, it was, and people could simply use the link to request to join, and I could approve them. Unfortunately, it’s not as straightforward this time. I’m SO sorry for advertising something I couldn’t actually deliver on. If you’d like, you can use this link (I so hope it works; it does for me, but I’m the admin) to join the 14 Day Challenge group. It’s not EXACTLY Whole30, but there are all kinds of resources for you there from the last go-round, and I will do my best to post there as well since I’m in the midst of this. Again, I apologize for the confusion/difficulty. I promise that, if/when I do another Whole 30, I will be sure to create a group for this blog, and be prepared to administrate it, so this doesn’t happen again. OOOOOOKAY. Onto the business at hand. Y’all know I love me some color. At least if you’ve read more than one blog post. You also know, if you’ve been reading a while, that our current house color looks like this. It’s Valspar’s Ancient Bog, and while it’s certainly not a common choice, we love it. Apparently y’all do too because, way back when, when we were building the addition to our current house, I polled you about which color we should go with (with the options being to repaint the structure–both new and old–or keep it the same dark green), and you guys pretty overwhelmingly voted to stay with the current color. Which…worked out well since that’s what we wanted to do too. 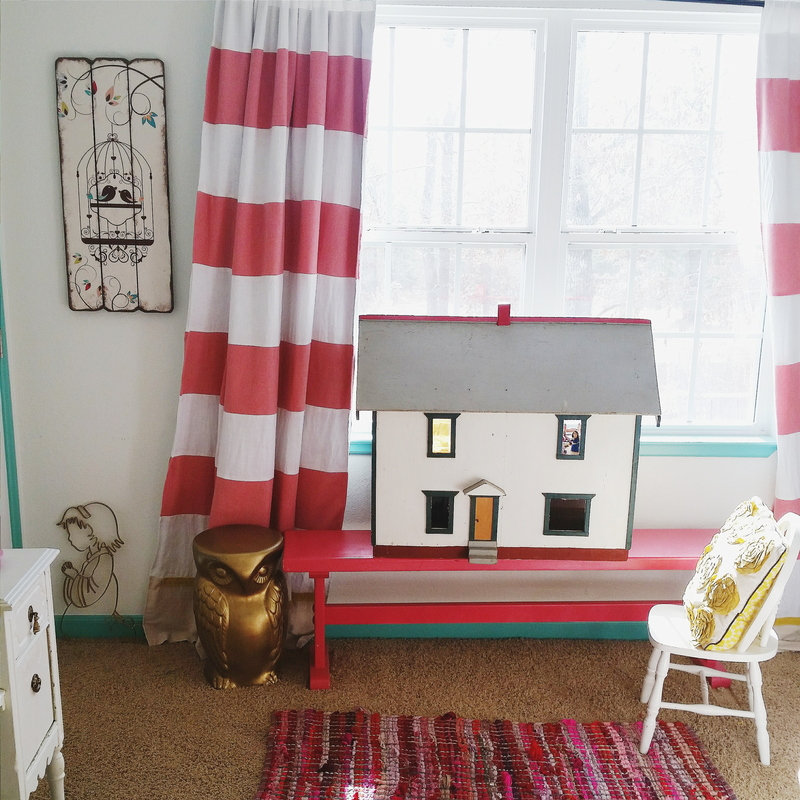 We repainted the trim a lighter, crisper color and fell in love with it all over again. Well, here we are again, trying to figure out what color to go with for the exterior of the new house this time, and I’d love y’alls opinions on which way we should go. Of course, I have a few ideas, but this one has been surprisingly hard to nail down for me because of the accents (shutters, trim, doors, etc. ), so I can’t say I’m 100% committed in any one direction. This one may surprise y’all because of my aforementioned obsession with color, but my obsession with this house from @farmhouseforfour (one of my ALL time favorite Instagram accounts; if you’re not following Lauren, click away right this second and remedy that) might trump it. 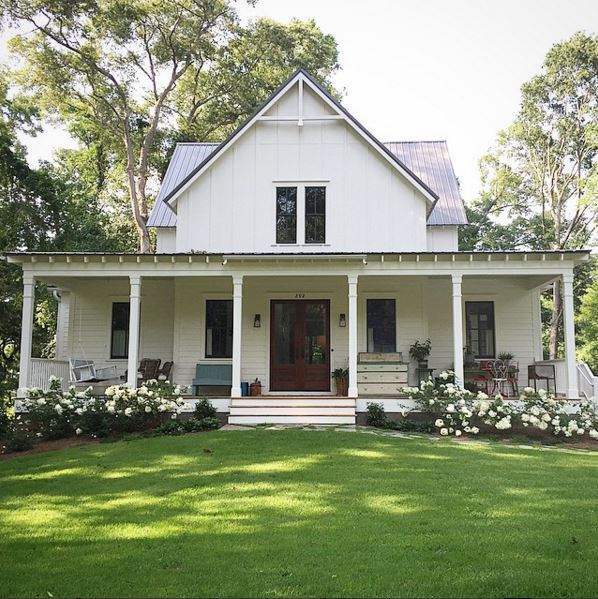 Maybe it’s Lauren’s impeccable taste and the way she manages to create the perfect mix of classic/rustic/farmhouse/chic or that fact that she and her family pretty much DIYed the whole thing, but…I’m seriously drawn to her simple white + black exterior color scheme. The architectural details just shine (not that that those beautiful limelight hydrangeas do anything to hurt the curb appeal). On the opposite end of the spectrum, we have what many will, I’m sure, think is an obvious choice for an aqua-file (with “aqua” being blue rather than water, in this case) such as myself. This house is actually a spec home created by such decor blogging heavy-hitters as House of Smiths and Tatertots and Jello, and I’m really drawn to how dynamic the color is without being too loud or bright. (It’s SW Riverway, and I picked it up not once, but twice–once in a single sample card and once as a part of a three color swatch–without realizing it when I went on a paint sample run the other day). As much as I love that yellow door, though, if I went this route, I would be deviating from that detail for sure. It’s just not me. I do love the idea of a pop of color via the door, though, and coming up with another non-clownish alternative has proven difficult. 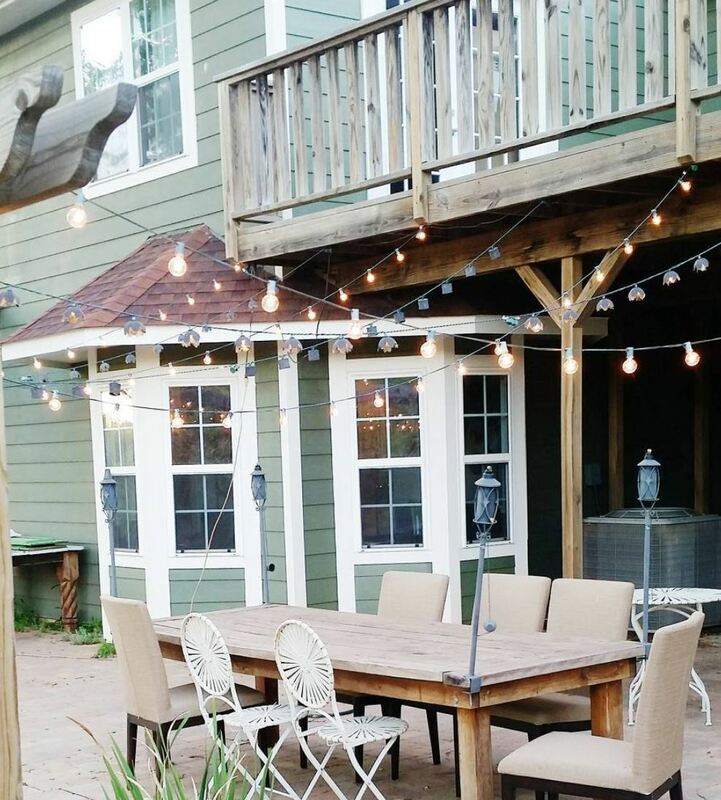 And then we have this lovely home from another big-time decor blogger–House of Turquoise. The greige of the exterior is the perfect weathered neutral–especially against the texture of the shingles and with that pop of color from the Wythe Blue door and shutters (not a super huge fan of the matchy-matchiness of those two, but the overall effect is very soothing). 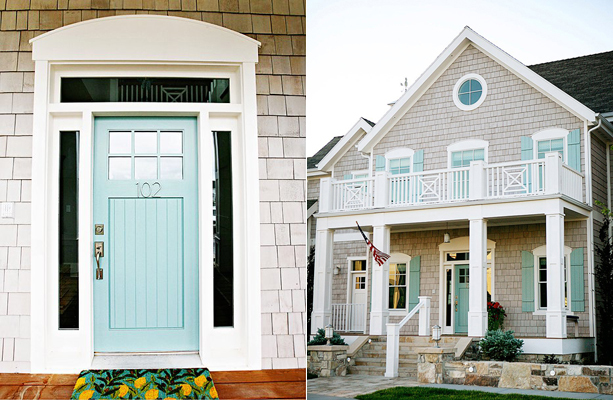 I’m not entirely sure I can pull off such coastal colors in our woodsy surroundings, but I have a feeling I would mentally breathe a great big, “Aaaaah” every time I drove up to our house if I chose these colors. 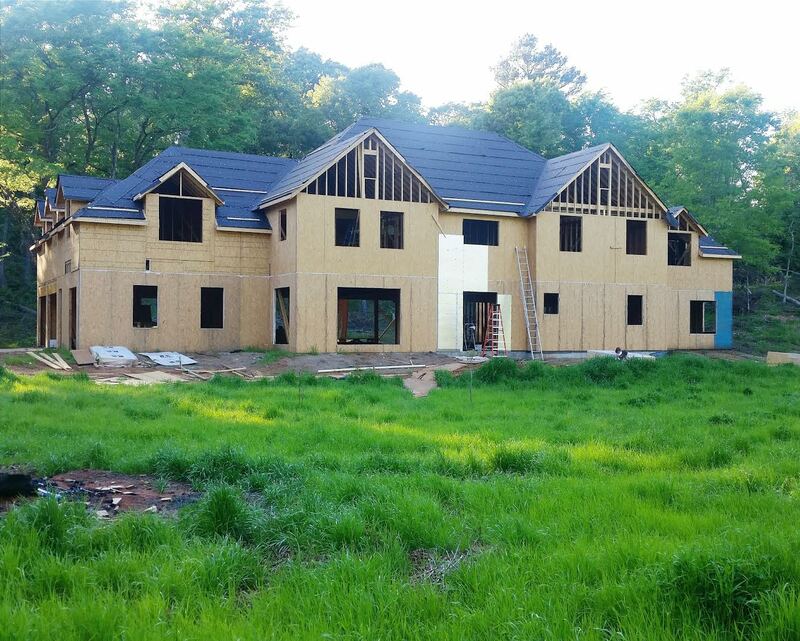 Just so you know, we are doing board and batten siding on the upper section, horizontal lap siding on the lower, and shingle detailing on the gables. There will also be a front porch with a metal roof (the rest of the roof will be traditional shingles). Oh! And shutters stained a light alder tone. I hope. I’ve always wanted shutters, but it kind of depends on how everything else goes down whether they will make sense with the look of the house. 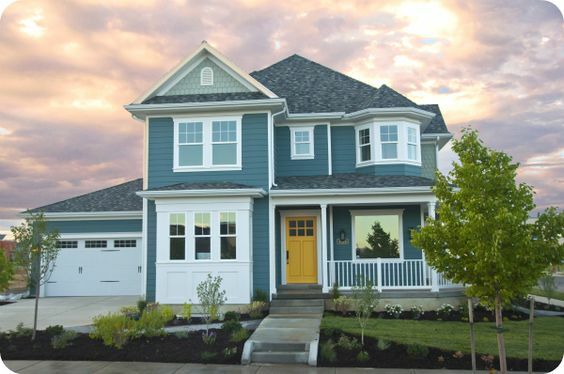 The entire house will be the same color, but I love the idea of bringing interest to it with the contrasting textures of the different roofing + siding options we’ve chosen. I just need the perfect color (+ accents) to tie it all together. Option 1, Option 2, or Option 3? Or do you have a suggestion for me? I’m all eyes! 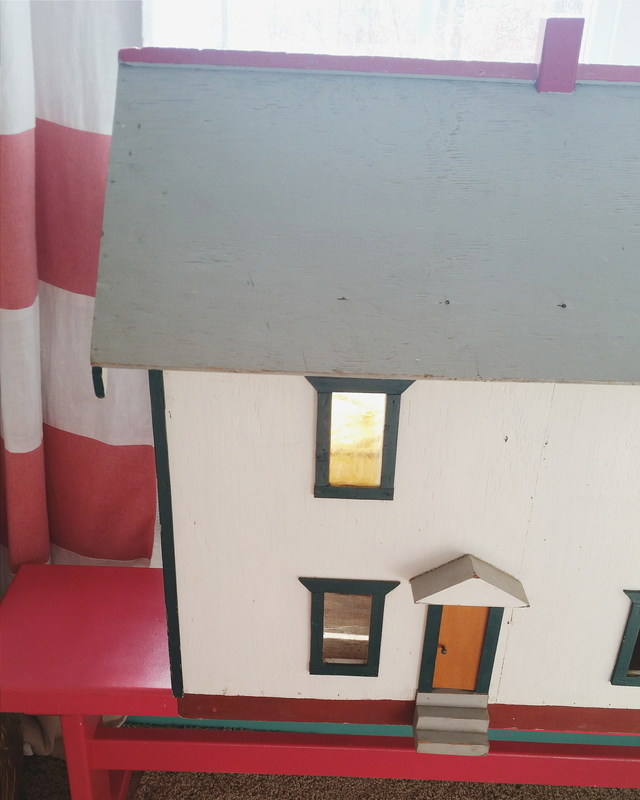 Well, I struck gold again this past fall when I stumbled upon this awesome (BIG) vintage dollhouse. It’s in great shape–just in need of some TLC and paint. 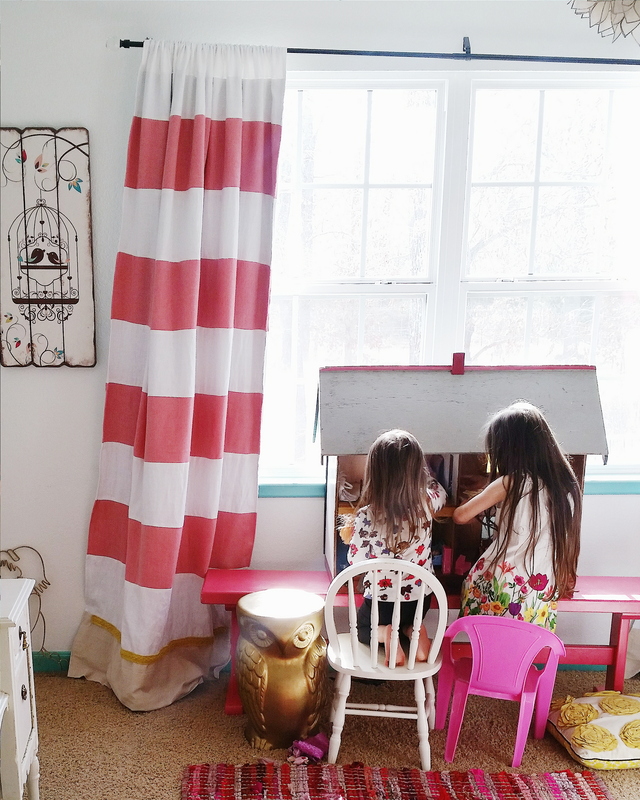 I had grand plans of redoing it by Christmas, but all the hustle and the bustle (I typed that in an Inigo Montoya “accent,” if you must know) of the season and aaaaallll of that doll-making I did definitely threw off my dollhouse reno schedule. I went ahead and gave her to the Della, Evy, and Nola, though, and here she sits, proudly perched in all of her mismatched glory in the girls’ shared room (which I hope to share with you in its finished state soon). Not that they mind. They happily bicker-play with her for whole 1′s of minutes before losing interest to devolve into full-blown cat fights (3-year-old twins, y’all. They are not for the faint of heart. Which might be why I get heart palpitations sometimes. Ha!). No, but seriously. The girls are pleased as punch with her current look. But that’s just because they don’t know JUST how much dreamier she’ll be when I finish with her white + aqua + gold transformation. (Apparently, I’ve been spending too much time on Instagram because I had an almost overwhelming urge to insert a heart-eyes emoji just now). An exterior makeover is all I have planned for the immediate future, but eventually I would love to go full-on crazy-decorator-mom on that unsuspecting little house. Think: wallpaper, tiny trendy light fixtures, chic fabric rugs. You know. In all my spare time. (And again with the emoji urge–this time for the crying/laughing one). Oh! And the best part of all for this little dollhouse is that I managed to talk the lady down from an already very reasonable $45 to $30, AND she threw in a whole shoe box full of dolls and cute furniture! So, yeah. Consider this your sneak peek at the before of The Great Dollhouse Project of 2016 (I can only imagine I will regret naming it that, but it’s too late now). And consider it MY accountability for actually making progress on it.